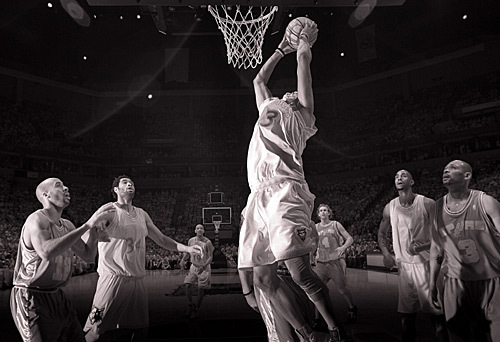 Tom Dahlin's infrared basketball photography is the twelfth in a series of SportsShooter.com features called "Trade Secrets." PHOTO 1: Eddie Griffin resting between free throws. One of my better assignments last year was for the Minnesota Timberwolves basketball team. My general instructions were to 'shoot some different stuff''. They were looking for unique images beyond the standard through the glass, overhead, and post remotes stuff we all shoot so much of. I gladly accepted the assignment, as I was also tired of shooting the games the same way each night. I started to think of how I could separate my images from the norm. Lighting was the first thought that came to mind. I had some success with this in the previous season, using a single strobe mounted high in a back corner to cast long shadows on the floor. I thought a similar light, placed really low, would emulate late afternoon sun and look really neat. The only problem was that I was sure I wouldn't last more then 2 pops of a floor mounted strobe before I was ejected. The solution came as I was playing with my infrared (IR) converted Canon D60 camera. I remembered some images that Weegee (Arthur Felig) made in the 1940's using IR sensitive film to photograph moviegoers in total darkness. He did this by painting his flashbulbs with a coating that passed IR light and blocked visible. I realized that by applying the same principles to modern equipment, I had my answer. A little background on the gear is probably in order here. The camera I used is a Canon D60, which is the successor to the D30 and precursor to the 10D. I bought a used one for around $500 and sent it to irguy@irdigital.net for conversion to a pure infrared camera. At the time, the modification cost about $350. This conversion removes the hot mirror IR blocking filter covering the camera's sensor, and replaces it with the opposite - a filter that blocks visible light and passes IR. The advantage of this is that the camera becomes much more sensitive to IR then an unmodified camera, requires no opaque filters over the lens, and allows one to use the camera exactly as if it were a regular model. For a flash I used a 1000 WS, battery powered, Elinchrom Ranger with a small 7" reflector and grid. To prevent the flash from being noticed during the game, I placed a filter to block visible light over the flashtube and behind the grid. This filter, opaque to the eye, allows IR to pass through unscathed. Only by listening for the 'pop' or by looking directly into the head can the flash be detected. PHOTO 2: Illuminated by two sources: Dahlin's ceiling mounted Dynalights and the floor level IR flash. Here the ceiling strobes were used to add a little fill light to the background, and were dialed down to be about 1 stop below the floor strobe. 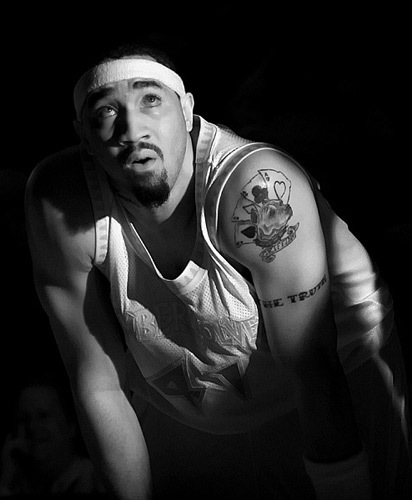 Photo 1 is a shot of Eddie Griffin from last years NBA season. It was shot during the game as Eddie was resting between free throws. I used an assistant to hold the strobe on floor level at approximately a right angle to my shooting line. I particularly like the strong side lighting. Photo 2 is illuminated by two sources: my ceiling mounted Dynalights and the floor level IR flash. Here the ceiling strobes were used to add a little fill light to the background, and were dialed down to be about 1 stop below the floor strobe. Now for the really cool part. An unexpected and pleasing result was the effect of 'tattoo popping' on the darker skinned players. Some guys have skin so dark that it is hard to make out their tattoos. (KG is a good example). I found that the IR light interacts differently then visible light with skin and tattoo coloring, rendering a much higher contrast. 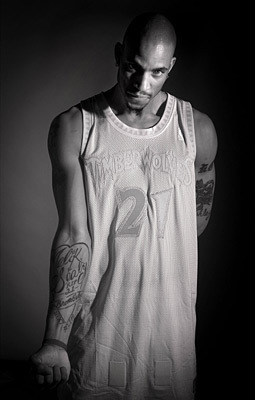 I took advantage of this effect at the Timberwolves media day this year, shooting several portraits of the guys showing me their tattoos. A nice example from this session is Photo 3, where Kevin Garnett is showing me his tattoo commemorating his late teammate Malik Sealy. If you study regular game shots of KG, you can hardly notice he has tattoos, let alone read them. For the portraits, I used a single flash head and grid and shot against a seamless background. There was no need to use the IR filter on the flash. The image files that come out of the camera are a monochromatic red. To process them to the black and white images shown in this note, all I did was de-saturate them and bump the contrast slightly. I also shoot in RAW format, as it gives me a little more latitude in exposure. PHOTO 3: Kevin Garnett is showing Dahlin his tattoo commemorating his late teammate Malik Sealy. I really like the way the portraits and action shots turned out. They certainly look different, that's for sure. More IR photos can be viewed in my special member gallery http://www.sportsshooter.com/tdahlin/nbair/ . I had my camera converted by irguy@irdigital.net. It cost me around $350 (conversion only) and took about 4 weeks. He can convert several models of both Canon and Nikon cameras. The folks at http://www.lifepixel.com also offer a conversion service at a slightly lower price. They also have an excellent photo by photo tutorial on how to DIY for any brave souls out there. A good starting point for information on IR photography in general, is http://www.infrareddreams.com. Tom Dahlin is a freelance photographer based in Minneapolis, Minnesota. He covers everything from preps to the pros, and his work has appeared in Sports Illustrated, SI-Kids, USA Today, and ESPN the Magazine. A twenty year stint in the R&D engineering labs of 3M and Honeywell provided him with a unique set of technical skills that he loves to apply to photographic problems. "Trade Secrets" is a series of educational features where SportsShooter.com members reveal the inside-information about how they were able to create a specific image (or two.) To nominate an image for this feature, please send a message to the SportsShooter.com admin staff here: http://www.sportsshooter.com/contactus.html The SportsShooter.com admin staff reserves the right to accept, or not accept, any nomination.